Of course, neither of us would give in to the other and we ended up at a stalemate over dance moves and who was the better storyteller. After all the back and forth I told Lisa in a coy way that if she were to play her cards right she may end up being my date to a friends wedding which was taking place the following summer. The reply she offered was how I knew that someday I would be getting down on one knee and popping the question. She looked at me straight in the eye and said “I’ll be attending a wedding in 2 weeks. Do you want to be my date?”. Now, this is certainly the last response I could imagine coming from a stranger that I just met in a pub on a Saturday evening. What made this invitation even crazier, is that the wedding was taking place in Chicago, Illinois! I thought to myself; I don’t know her but I love pizza, I’ve never been to Chicago, and I figured she was pretty cute so I decided to take the risk and book my flight. Given that I haven’t discovered where the Money Tree grows (yet) it was a good thing that I saved up a bunch of Southwest Airline Points for a snowy day just like this one. The ironic thing is that those airline points helped me rationalize this whole crazy adventure and will actually become a game changer in our lives! It turned out that we both loved exploring Chicago and apparently my dance moves didn’t scare her off! It wasn’t soon after that we discovered Basic Travel and began exploring the world using award points from credit cards. 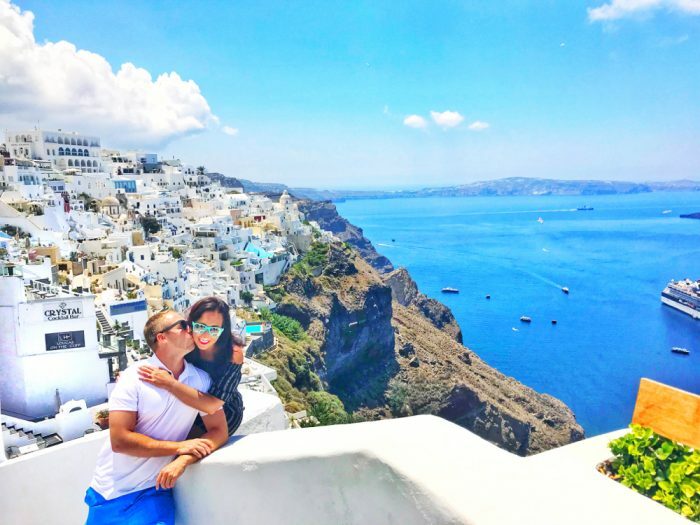 Over the next 3 years, we jumped out of planes in Hawaii, explored ice caves in Iceland, repelled down waterfalls in Costa Rica, and explored many temples and beaches across beautiful Thailand. 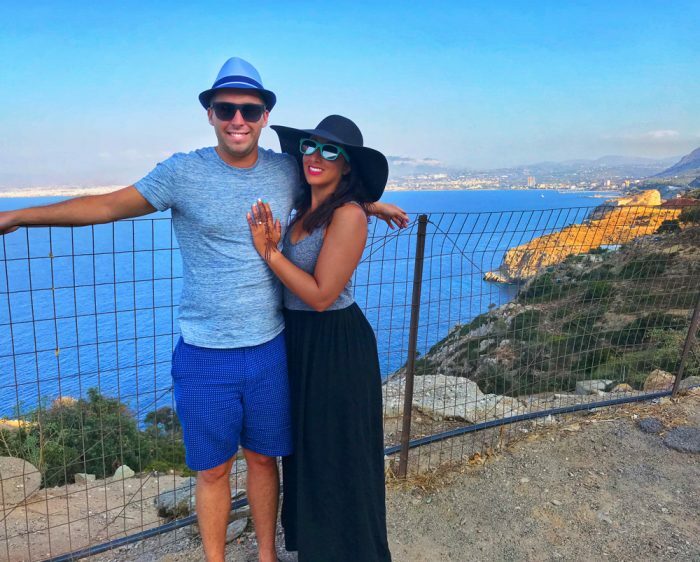 I knew that my surprise engagement had to be somewhere special and would need to follow in line with excitement and adventure that we both love. The place that I ultimately decided to go big with certainly fit all of those requirements from above. The Great Pyramid of Giza has been a place that I have wanted to visit since opening my very first history book as a young student in grade school. 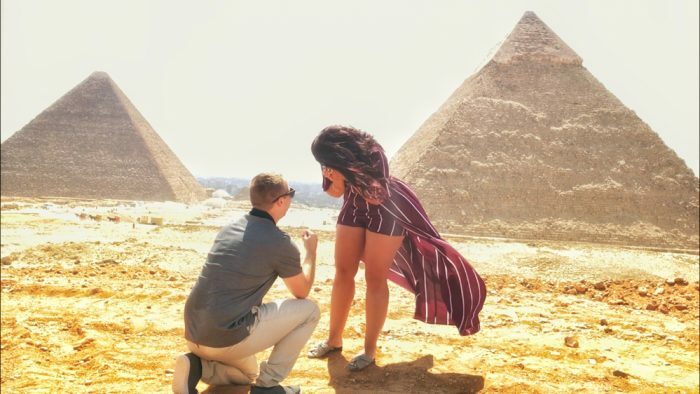 Now that I had my place in mind, I had to figure out how the heck I was going to get me, her, and a RING to EGYPT! It sounds crazy writing that out here but I was determined and began scouring the internet for anything and everything that was relevant to my dream proposal. I stumbled across a recommendation for a tour guide that specializes in unique tours of all the Egyptian Highlights that you would imagine experiencing while visiting. He was very receptive and quite excited to help me in my quest. If you’re interested in touring Egypt, I highly recommend that you message Taha Marie on Facebook. Now onto the flights! Luckily we have become pretty good at finding and booking award travel via those points I mentioned earlier. I found two Delta Credit Card Offers that would give me 120,000 SkyMiles. It turns out that 2 roundtrip flights to Egypt would cost me a grand total of 120,000 SkyMiles or over $12,000 in savings! You can see more of our Basic Travel Hacks found on our blog. With all of that money I saved on flights, I was able to buy an actual Engagement Ring which was better than my first idea that involved a quarter machine at the local grocery store :). Reeds Jewelers is an amazing shop to find exactly what you are looking for and the owner, Jeffrey Zimmer really went above and beyond to help me find the perfect ring! We boarded the flights to Egypt right on time and the countdown began to me saying the 4 most important word that I’ll ever say in my entire life. Our Egyptian Guide Taha met us at Cairo International Airport and took us out on a fun night which included traditional Egyptian food and dancing all aboard a cruise down the Nile River! The following morning I met Taha down in the lobby of my hotel extra early to review the game plan for my big moment. He explained that we were going to visit multiple spots around the pyramids throughout the day and that he would give me a signal to decide if it were the right place for me to do it. 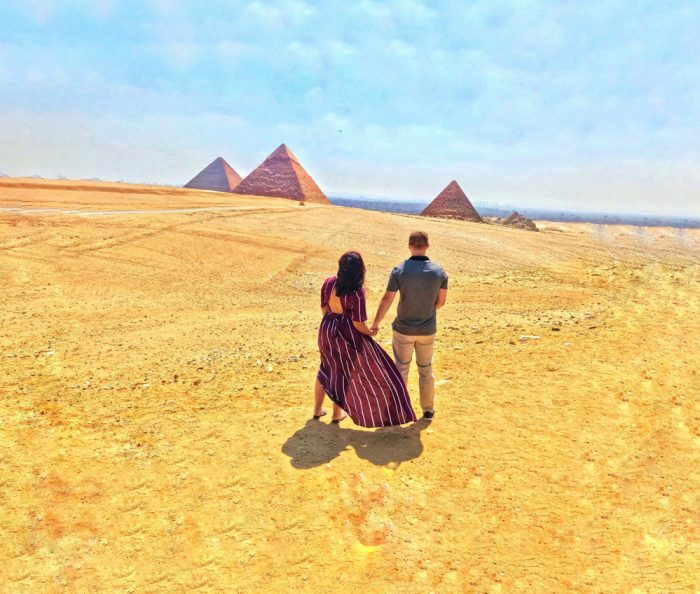 We started with exploring the inside of the Great Pyramid of Giza and proceeded to walk around the outside taking it in from different angles. Taha gave me a few signals here and there but nothing felt like it was the “right” place for me to lay everything on the line. Taha told us that we were going to ride camels around the pyramids next but would be stopping at a quick place for a photo. We arrived and I took one look and knew that this was it. I asked Lisa to pose and get some solo photo’s before I joined her and then….One Big Deep Breath. As you can see from our beautiful photos, she said yes and instantly all of my hard work in planning this surprise engagement was worth every second! I once read somewhere that “There will always be people who say your dreams are impossible. But they can’t stop you unless you agree with them.” This quote has carried with me and with the right person by your side you can accomplish anything you dream of!